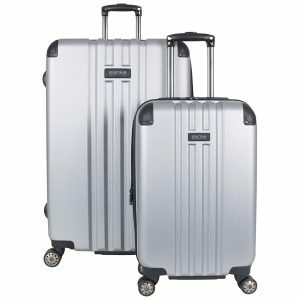 Kenneth Cole Reaction Reverb is a hard side expandable 8-wheel spinner luggage that is offered as a set of two pieces (20” and 29”), three pieces (20”, 25” and 29”), 20-inch carry-on and 29-inch large suitcase. You may purchase it in light silver, black, ice blue or rose gold. The rating is 4.3 out of 5 stars by 201 customers that have purchased and used the luggage. These bags are expandable by another 1.5 inches so that you can put more of your stuff in. They are made of durable ABS plastic that is lightweight and sturdy at the same time. They also have the special molded corner reinforcements that make them even more resistant to impact or whatever bad treatment they may encounter by the airport staff. Inside there is the full lining that is tear resistant and that zipped compartments and straps can keep your belongings well organized. There is an expansion zipper in the main section and winged garment restraints with zipped pockets for your smaller items. You’ll have more storage capacity by unzipping the left side compartment and there is an organizer with a mesh zipped pocket and an elastic top shoe pocket. It is easy to move the bag on its 8 durable spinner wheels by holding the retractable locking handle- they rotate easily 360 degrees, in all directions. The bags have the bottom grab handles to lift them up easier. The 20-inch upright bag weighs 7.5 pounds and measures 22 x 15 x 8.5 inches including the wheels and the handles. It can be used as a carry-on bag and you can take it onto the plane on most US and overseas flights as it has passed the inspection for the most strict US airlines. And it will fit in the overhead bin above you on the plane. 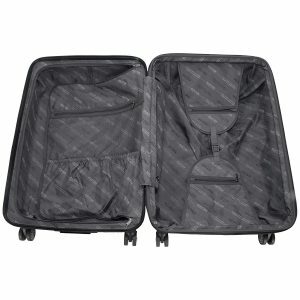 The medium 25-inch suitcase weighs 10.7 pounds and has the measurements of 27.5 x 19 x 10 inches and the largest 29” suitcase weighs 12.35 pounds with the dimensions of 31.5 x 22.0 x 13.5 inches. You need to check in both of them before your flight as they are too big as carry-on bags. The expandable part makes the bag feel somewhat flimsy, but it still is quite sturdy overall. The retractable handles move up and down very smoothly and they feel quite sturdy with the chrome bits that make them look and feel premium. You’ll find many Kenneth Cole logos inside which you may or may not like to see. The wheels can be replaced if or when they are worn out. The bags will hold up well over many travels as long as they are not treated very badly. All the three suitcases fit inside each other and you should store them like that when not traveling. They all have the top carrying handles and the two larger non-cabin suitcases have the side handles. For the price level these are great solid bags with different compartments, expansion, sturdy build and modern looks. These Kenneth Cole bags can be compared to the more expensive suitcase sets that cost up to 300 dollars. They are offered with the ten yers of limited warranty by the manufacturer.